Although the quality of student writing is often lamented by faculty, writing instruction is an area of nursing education that has received little attention. Nursing programs rarely teach writing from a disciplinary perspective, and promoting the drilling of basic skills, such as grammar, has failed to engage student writers. A critical examination of the history of writing research, the nursing academic context, and the epistemology of writing as meaning making will provide the rationale behind a need for a new perspective on nurses' writing. A model to support socially constructed writing is proposed, which explores the writer's identity, relational aspects of writing, creative and emotional knowing, and the writing context. Academic writing instruction—and best practices for the induction of students in any discipline as thinkers and writers—is subject to two approach debates. Writing can be taught as a generic skill focusing on grammar and syntax and structural basics, presumably transferable to all contexts, or it can be taught within a disciplinary context that introduces students to the genre, tacit knowledge, values, relationality, and identity forming processes inherent in an academic discipline (Elton, 2010). Rarely are the two schools combined. One criticism of the skills-based model is that it is deficit focused rather than strength based and assumes all student writing is deficient and in need of remediation (Allen, Bowers, & Diekelmann, 1989; Elton, 2010; Lea & Street, 1998; Lillis & Turner, 2001; Nightingale, 1988). The discipline of nursing acknowledges that most writing instruction is situated within English departments or conducted by generic writing experts (Andre & Graves, 2013; Hanson Diehl, 2007; Luthy, Peterson, Lassetter, & Callister, 2009), which ensures that nursing's disciplinary values, discourses, and conventions will not be nurtured in the instructional process of learning to write. Disciplinary discourse perspectives of writing recognize that writers situate the language choices they make, their stance, and their knowledge within the tacit social context of their discipline (Hyland, 2004). However, generic instruction assumes the writing act is objective, formulistic, and positivist in nature (Gimenez, 2012; Mitchell, 2017; Webb, 1992)—a stance that Ryan, Walker, Scaia, and Smith (2014) referred to as insular, and which is also incongruent with the nursing value of relationality. Positivism, as applied to academic writing, assumes that it is possible for the author to separate themselves from past experience, emotional response to the content, and the context in which the writing takes place. Positivists see writing as mechanical and linear, and thus measurable through quantitative methods (St. Pierre, 2014). The author is expected to remain invisible in the work (Mitchell, 2017). Passive voice, avoidance of first person, and a disengaged narrative are considered features of positivist writing (Tierney, 2002). In the international nursing literature, periodic calls have been made for nurses to change the way they write and teach writing. Although nursing's current preference for objectivist writing has taken us from a burgeoning scholarly discipline to an established research discipline, Fairbairn and Carson (2002) argued that nurses need to be able to write in a manner that tells the stories of nursing. Those stories occur primarily in practice, and writing that is jargon filled, obscure, and speaks only to audiences of researchers will not have reach beyond the walls of academia. The goal of writing should be to create meaning and knowing. Writing that has meaning to practitioners, students, and the public requires considering factors, including disciplinary and writing context (Allen et al., 1989; Dieklemann & Ironside, 1998; Gimenez, 2012; Webb, 1992), creativity (Hanson Diehl, 2007; Rolfe, 1997), emotional responses (Chaudior, Lasiuk, & Trepanier, 2016; Parboteeah & Anwar, 2009), audience needs (Rolfe, 1997; Ryan, Walker, Scaia, & Smith, 2014), reflexivity (Mullhall, 1997; Ryan et al., 2014), and writer identity and voice (Mitchell, 2017; Ryan et al., 2014; Webb, 1992). These are only a sampling of citations from nurse writers who have previously connected the values of nursing to the writing process, although interdisciplinary authors looking at writing's social constructs present similar factors (e.g., Flower, 1994; Game & Metcalfe, 1996; Ivanič, 1998; Nightingale, 1988; Richardson & St. Pierre, 2005). The inspiration for this article was established during a project I conducted with colleagues (Mitchell, Rieger, & McMillan, 2017), examining the items on existing writing self-efficacy questionnaires used in published research. This project was initiated as a preliminary step to the development of a writing self-efficacy questionnaire, which considers the constructivist elements of writing. A template analysis method was used to categorize and theme the individual items on 11 published writing self-efficacy measures. Bandura's (1977, 1997) self-efficacy theory and a cognitive process theory of writing by Flower and Hayes (1981) were used to identify a priori themes for the classification of the items. During the review process, one anonymous reviewer questioned, “Do these frameworks make this emerging, revised measure nursing discipline-specific or will another nursing writing framework (yet to be determined) need to be added to the analysis?” The current article, which examines writing from the stance of social constructionism, responds to this question of need for a model of writing amenable to the nursing discipline. To provide additional background congruent with a social constructionist perspective, which states that a writer's reality cannot be separated from the context of writing or the past experiences and identity of the writer (Andrews, 2012), it will be relevant to understand that I am a registered nurse who has focused much of my nursing career in academia with an interest in exploring the writing experiences of undergraduate nursing students. Thus, much of my perspective on writing has developed over 15 years from working with and listening to the writing fears, frustrations, and elations experienced by my cohorts of students. Only 6% of Canadian nursing programs offer a discipline-specific writing course (Andre & Graves, 2013). I was the course developer for one of those courses. The details of the instructional activities offered in that course are reported in Mitchell, Harrigan, Stefansson, and Setlak (2017). The focus of this article is to provide the rationale behind a need for a new perspective on nurses' writing. It discusses writing as a process that is not only socially constructed, but also establishes the identity of the writer within a discipline. A writer does more than make text, in this perspective; a writer makes meaning (Flower, 1994). The position taken is that nursing has fallen behind in exploring writing as an acculturation mechanism for the discipline by perpetuating outdated and positivistic modes of writing and failing to progress the teaching of writing outside of the basic skills perspective. Through an examination of the history of writing research, the nursing academic context, and the epistemology of writing as meaning making, a model of writing for the nursing discipline is presented. An introduction to the trajectory of theoretical thinking on writing and its movement from product to process to social constructionism is relevant. The 1970s is thought to be the decade that marks the beginnings of empirical writing research (Nystrand, 2006). Early writing research assessed writing by its product or text, a perspective that has positivist undertones because it focuses on what is objective and measurable (Nightingale, 1988). In product perspectives, the author and text are separate entities and the author is invisible and thought to not exist in the product. Product assessments decode writing for its grammar, syntax, and structure—the surface elements of writing—which are limiting to our understanding of the complexities inherent in the act of composing written work (Elton, 2010; Mitchell, 2017). The dangers inherent in the product prospective of writing are most evident when exploring the literature discussing perspectives on writing assessment. Writing scholars examining the effect of product-focused assessment recognize the limits of focusing on grammar alone to assess writing. Evaluating requires a balance between giving some corrective guidance for learning and not overly focusing on mechanical aspects as to ignore ideas expressed. Analyzing examples from undergraduate student papers and their associated evaluator comments, Lillis and Turner (2001) demonstrated how vague grading comments, such as “faulty grammar” or “faulty punctuation,” left students unable to identify the errors in their writing. Indicating deficit without correction leaves the impression that these conventions are common sense, are easily transferable from context to context due to past learning, and should not need to be taught. Diekelmann's and Ironside's (1998) doctoral student participants lamented the technical requirements attached to their candidacy examinations and their struggles to fulfill them. Evaluators would use rulers to assess margin width and were inflexible on page requirements. These doctoral students learned to write quickly and to let their advisors tear their work apart in an earlier draft because no matter how polished the writing was, it would always be returned with heavy criticism. Focus on these surface characteristics of writing is a deficit perspective. When student writing is viewed from this deficit perspective, which neglects examining the writing process, creativity, emotions, and student identity, students' knee-jerk reaction is to devalue the importance of writing. They then develop resistance to accepting the value of developing a practice of writing to help them integrate knowledge from their discipline into their identity and practice (Hathaway, 2015) or, as Dieklemann and Ironside (1998) observed in their doctoral nursing student sample, it leads to disengagement. With the recognition that writing product assessments were limiting, cognitive processing models began emerging in the late 1970s, with the most widely discussed process model developed by Flower and Hayes (1981) and then later revised by Hayes (1996). The composing process, rather than the text or the writer, becomes the focus (St. Pierre, 2014). Process models recognize that writing is recursive, not linear, and that product and process are deeply intertwined. Thus, the product cannot be separated from its producer (Richardson & St. Pierre, 2005). Writing processes are diverse and theoretical discussions of them are broad enough in scope that it is accepted that no two academics would model, or teach, the same writing process (Elton, 2010). The writing as a process movement broadened scholars' understanding of the complexities of writing, but their primary weakness was the tendency to decontextualizing the writer from their cultural and social environment. They ultimately depict the writer as “an isolated individual struggling to express personal meanings” (Hyland, 2003, p. 18). Ivanič (1998) demonstrated the difference between the process and social views of writing identity. Although both consider the writer's identity to be a crucial factor in the product, the social view recognizes that the writer is also reinventing themselves within the text while attempting to build a relationship with the reader in the process. The writer creates or visualizes a version of the reader and integrates that imagined reader's needs into their word choices and depth of description. When a reader reads the text, they then invent a version of the writer. Both mechanisms influence the meaning imparted and the understanding created in relation to the content being presented. Process models focused on the how questions about writing to the neglect of the why (Hyland, 2003). The evolution of writing theory in the 1980s and 1990s has since evolved into a perspective congruent with a social constructivist epistemology. Social constructionism views knowledge and truth as created by the mind, not discovered (Andrews, 2012). Reality, then, is constructed by individuals through community experience and through conversations and relationship building with others (Ward, Hoare, & Gott, 2015). A constructivist approach to writing acknowledges that there is an alternative story present behind the language used in text, even when that text is describing empirical research (Ivanič, 1998; Mulhall, 1997). That reality may be presented to the reader selectively and strategically. Product and process models are grounded in the belief that writing, and concurrently reading, are undertaken only for purposes of communicating. Social models recognize that the acts of reading and writing require that two (or more) individuals, remote in time and space, make a connection with one another. Meaning is generated in a complex negotiation between readers and writers where each bring their socially constructed perspectives, identities, and past experiences to the creation of the text and the interpretation of that text (Flower, 1994; Game & Metcalfe, 1996; Ivanič, 1998; Nystrand, 2006; Rolfe, 1997; Straw, 1990). Beginning from a premise of social constructivist thinking implies that any model of writing proposed should consider the influence of contextual factors, identity, and development of the reader–writer relationship on the writing process. Writing is a social act that takes place within interpretive communities (Bruffee, 1986) or discourse communities (Gosden, 1995), and those communities socially construct reality, thought, text, knowledge, facts, and selves (Bruffee, 1986). The extension of this knowledge is that writing assignments will teach students to develop their identity within a discourse community. This immersion into a community is not without struggle, as numerous unwritten rules exist as to how to be successful within that discourse community and little is known about how novice writers in these environments come to know and apply these rules as they are generally not explicitly taught (Gosden, 1995). Nursing as a discourse community has a much-discussed gap in priorities between theory, education, and practice, which has resulted in an anti-academic discourse where nurses in practice view the requirements of academia as hegemonic and unrelated to good nursing (Laiho & Ruoholinna, 2013). This gap has created problems for the nursing discipline with respect to their ability to connect the value of writing to professional nursing practice. An analysis of the nursing education literature suggests that nursing continues to take a skills-based product focus to writing instruction. In Canada, most writing instruction in nursing programs occurs through generic writing courses, English literature courses, or a combination of both. In 48% of programs, no writing instruction is required (Andre & Graves, 2013). The failure of the generic one-size-fits-all approaches to writing instruction is often evidenced by student descriptions of their difficulties attempting to transfer their writing knowledge from one discipline to another (Chaudoir, Lasiuk, & Trepanier, 2016; Lea & Street, 1998). Different disciplines often have different rhetorical styles, which in simplest terms means different conventions for forming an argument. The school of literary scholarship, known as rhetorical genre theory, analyzes texts by their familiar repetitive structures (Paré, 2014). It recognizes that writing in a particular discipline serves a social purpose. Nursing rarely uses words such as genre, rhetoric, or transfer when theorizing about disciplinary writing issues; yet, we have a genre and we have a rhetoric of our own. Some of that rhetoric comes from the traditions of biomedicine and objectivist epistemology, as described earlier. Some of it may come from our widespread adoption of American Psychological Association (APA) style. Nursing is a citation-heavy discipline. We are more comfortable with writing that pays homage to more senior published experts in the field rather than allowing our own voice to be privileged (Ryan et al., 2014), which is in contrast, for example, to history or literary studies (Madigan, Johnson, & Linton, 1995). Discipline members often know what particular texts (e.g., an academic paper) are supposed to sound like. Disciplinary expectations are tacit and socially constructed. We can read articles from nursing, medicine, psychology, history, and literature and know there is something different in the structure or approach of each but perhaps not be able to articulate what that difference is, except maybe by surface elements. Experts in a discipline can recognize when their discourse has been handled successfully and within “the rules.” Novices to a discipline, on the other hand, can only draw from their past writing experience to accomplish a writing task. If that writing fails to fit the expectations of the disciplinary expert, it will be criticized and downgraded. It may even appear to the disciplinary expert to be poor writing in need of remediation. Because it is often difficult to put into words what is wrong with a piece of writing when the problem is a matter of unusual phrasings or word choices that do not fit the typical discourse for a discipline, it might simply be labeled as unclear, colloquial, or grammatically incorrect. What is actually a social acculturation problem is then mislabeled as a problem with the product. Students have learned to write prior to entering nursing, but it may not be the kind of writing that fits nursing's discourse preferences. Students need ongoing instruction and mentorship to transfer their writing skills from a familiar writing task, or genre, to an unfamiliar writing genre and be successful (Tierney, 2002). This thinking needs to expand beyond disciplinary transfer to exploring the expectations of individual instructors and courses. Each assignment presents new metacognitive demands and has its own instructional needs (Slomp, 2012). Yet, educators often expect students, without guidance, to be able to adequately address the requirements in any course assignment simply because they have received generic writing instruction. In nursing, most educators are not writing experts, so a gap exists between what nursing needs in terms of writing instruction and what they have been able to provide due to lack of skill in those faculty assigning the writing (Troxler, Vann, & Oermann, 2011). An issue unique to the nursing literature is acknowledgement of the reluctance among nursing instructors to assign writing assignments for reasons including the time-consuming nature of grading (Luthy et al., 2009), the “unwelcome challenge” (Mandleco, Bohn, Callister, Lassiter & Carlton, 2012, p. 25), or that instructors may doubt their own writing capacity and therefore may be reluctant to assign and grade student writing assignments (Whitehead, 2002). Each of these instructional issues contributes to students' lack of value in their writing assignments. The nursing literature often reports that student writing problems are described as being limited to the mechanics of writing (Diekelmann & Ironside, 1998; Mandleco et al., 2012; Troxler et al., 2011; White & Lamson, 2017). Strategies to improve student writing are described in two systematic reviews on the topic (Oermann et al., 2015; Troxler et al., 2011). These reviews summarize interventions that range from quick-fix grammar and APA tutorials to the more time-consuming (and more effective) strategies involving scaffolded leveling of assignments or submission of multiple drafts for feedback. Strategies gathered in these reviews were program specific and the majority were not evaluated using research evidence. To provide two recent specific examples of writing assessments targeting grammatical and structural focused interventions, Mandleco et al. (2012) used quantitative methods to assess student writing before and after the writing workshop, with content including “punctuation, grammar, professional voice, plagiarism, clarity of expression, and paragraph and sentence coherence and unity” (p. 5) using a tool that assessed the basic elements (i.e., verbs, pronouns, punctuation, capitalization, and sentence faults). They observed improvement on only half the grammatical items assessed based on the workshops, but degree of overall improvement of writing was assessed only anecdotally where reports from faculty identified that student writing improved. White and Lamson (2017) described a teaching innovation in the form of a voluntary workshop that targeted “issues with writing mechanics, composition, using current evidence, and formatting of citations and references” (p. 444) and provided students with a checklist for revisions that focused on APA formatting issues and directed students to page numbers in the APA style manual. The workshops were poorly attended, reminiscent of Hathaway's (2015) warnings that writing instruction framed as addressing deficiency will encounter resistance from students. Neglecting to recognize students' previous learning, devaluing how much of a student's identity is inserted into his or her writing, neglecting interpretative factors such as how to understand the meaning of complex research studies and academic papers, and eliminating creative opportunities to inspire thinking and knowledge are ineffective ways to stimulate student buy-in for the importance of writing in nursing. Applicability of writing in a clinical practice discipline has also been discussed. Whitehead's (2002) student participants questioned the applicability of writing to clinical practice. Cottingham's (2005) discussion of the need for writing in nursing is scathing, with an arguable element of satire, as he is clearly a skilled writer himself. At his worst, he accuses nursing academics (who he describes as “ethically timid” and “underperforming intellectually” [p. 1]) of deemphasizing bed creases and denture care in favor of dithering over which line to indent on a reference list. At his best, he observed, quite correctly, there is no evidence base to claim a connection between good essay writing and good nursing. But Cottingham's (2005) argument is based on the view that student writing requires remediation because it is perpetually grammatically inept, which reduces student writing to products without consideration for the process and identity building that develops through the act of writing. Given the preponderance of discussions of the benefits of academic writing on thinking and knowledge creation as I have cited throughout this article, I am tempted to ask the question, “Does it matter that objective evidence is lacking to establish if good writing leads to good nursing?” But given how nursing academia has aligned itself with a positivist view of science and the need for objective evidence, it very much matters indeed. Academic knowledge is, from the perspective of practitioners, hegemonic and therefore elitist (Mulhall, 1997). Laiho and Ruoholinna (2013) stated that new university graduates of nursing eventually adopt the anti-academic discourse as a way of fitting in to the practice environment. Having spent the majority of my career in nursing education teaching academic writing and research to nurses, I can confirm that some students' disdain for these subjects begins much earlier than during their immersion into the culture of practice. These courses are difficult and demanding, and the sense of succeeding at the material lacks the instant gratification and glory present in the ability to start an intravenous or insert a Foley catheter. Some see courses of this nature as a waste of their time. Their devaluing of course material shows up on course evaluations in statements reflecting their opinion that writing and research have nothing to do with nursing. The benefits of the discipline-specific approach to writing that are critical to the nursing discipline are well documented. Writing can cultivate a professional identity where student writing at all levels (undergraduate, masters, doctoral) facilitates students' ability to find their fit within the discipline and helps them identify their passion for areas of nursing practice (Chaudoir et al., 2016; Rolfe, 1997; Ryan et al., 2014). Writing plays a role in academic socialization, providing opportunities for students' development as scholars and thinkers, aiming to be transformative through providing students with opportunities to not just think about the knowledge they have within their discipline in a holistic fashion but also talk about that knowledge (Hathaway, 2015; Lea & Street, 1998). Integration of sources through synthesis and reflection on practice can stimulate critical thinking (Allen et al., 1989; Chaudoir et al., 2016; Springer & Clinton, 2015) and facilitate the development of competencies in nursing assessment and practice and communicating them to the broader nursing community (Chaudoir et al., 2016). Writing instruction that considers many audiences and recognizes the importance of the relationship between faculty and student in the writing process can contribute to developing relationships within the classroom (Chaudoir et al., 2016), with readers, or with patients (Ryan et al., 2014). Yet, these benefits reflect the values of nurses in academia and contrast dramatically with the views of some nurses in practice and some nursing students who see writing as having no value to their day-to-day work (Cottingham, 2005; Whitehead, 2002). Disciplinary factors, such as argument styles, citation expectations, use of nursing-specific language and word choice, play a role in writing (Hyland, 2004; Ryan et al., 2014), and students are often graded by disciplinary preferences and knowledge requirements before those preferences are taught. Students learn what is required of them by trial and error and the frustration of attending to a wide variety of preferences among faculty contributes to their disillusionment with writing (Chaudoir et al., 2016; McCune, 2004). Students who receive feedback that is limited to grammar and mechanical errors and ignores their content, ideas, and the creative elements of their writing may feel as if their identity has been attacked or disregarded. In this perspective, students see their essays as extensions of themselves, and feedback that ignores the personal aspects of writing leads to student detachment from their writing and they develop difficulty defining themselves as writers (Torres & Anguiano, 2016). Consequently, students see themselves as facing these frustrations alone and without support. They do not realize that these personal disruptions are normal and are present for all writers at all stages of their careers (Antoniou & Moriarty, 2008). Nursing needs to rethink the critical aspects of the way we write and present knowledge. Defining writing by its mechanical and structural aspects is like defining nursing by its tasks. If writing is a social construction in the creation of knowledge, then a disciplinary focus on writing competencies in students and nurse writers broadly needs to be discussed and integrated into professional curriculums. If continuing to preserve a product model in writing instruction and grading is leading to disengagement, then acknowledging the social aspects of writing may help make the value and need for writing visible. The remainder of this article is dedicated to discussing the constructs and attributes that should be considered as contributing to the writing act, writing pedagogy, and in providing writing feedback. The model can be applied in a scaffolded manner from undergraduate, master's, doctoral, and professional writing contexts. The model was developed based on characteristics and values present in a social constructivist epistemology. The development of the model emerged through a lifelong journey with writing and a personal and professional engagement with the interdisciplinary writing literature. Like most academics, I have had no formal academic writing training; however, I have taken creative writing courses. My postsecondary initiation with academic writing occurred in the literature and history departments in my prenursing undergraduate degree. My writing skills were honed through creative and fiction writing, which means I have always recognized the aspects of academic writing that are creative in nature—the bringing together of diverse and seemingly contradictory ideas and the interpretive synthesis required to have an innovative take on a concept or research approach. The emotional extremes, and the connection between writing and identity, are similar in the creative and academic writing experiences. Many theoretical passions begin haphazardly. Mine began when, in an unrelated literature search, I stumbled upon two academic articles linking academic writing and creative writing (Antoniou & Moriairty, 2008; McVey, 2008). Thus, due to my personal writing experiences and my reading on creative writing, creativity as a component of this model was an a priori assumption in this model development. I began exploring the writing literature in depth while preparing to write research manuscripts. Two previous articles had a strong influence on the development of this model and its philosophical perspective. Researching the definitions of the writing terms associated with Flower's and Hayes' (1981) cognitive processing model of writing and the search for appropriate labels for the other writing constructs that were themed from the writing self-efficacy questionnaires (e.g., Mitchell, Rieger, et al., 2017) prompted another theoretical journey exploring the nature of academic voice (Mitchell, 2017). A discussion within the self-efficacy instrument analysis team about what defined writing voice (i.e., did it, or did it not, include argument?) prompted a deeper exploration of that concept. The research for those two articles led me down many rabbit holes, the most significant of which (to this article) introduced me to Ivanič's (1998) work in writing and identity and Hyland's (2003, 2004) work in disciplinary discourse—the latter of which alerted me to the contextual, disciplinary nature of writing. Exploring the problem inherent in viewing student writing from a deficit perspective caused me to stumble on nursing's anti-academic discourse as an explanation for the problem I was living in my professional world where I sensed a deep devaluing of writing and its importance to the nursing profession and nursing education. When I was asked as part of my doctoral studies to explore a controversial philosophical issue in my research area, this devaluing and anti-academic discourse was an obvious starting point. Pairing that anti-academic discourse with the question proposed by the reviewer for the writing self-efficacy instrument analysis (quoted earlier) sent me down the path of exploring the theoretical attributes of constructivist writing and its relational, contextual, identity-forming, emotional, and creative attributes. Therefore, it was not one literature search that informed this article, but rather several. Using the “one stop search” platform at my institution to capture multiple databases, I focused on literature examining writing voice, writing identity, writing in nursing, disciplinary discourse, nursing discourse, discourse analysis and nursing, writing theory, writing as a way of knowing, writing as a method of inquiry, and writing and social construction. Writing as a concept is not well indexed in most databases (including the nursing database CINAHL®) so searching for the stem writ* in the titles of articles proved useful. The most valuable literature was found through citation tracing and examining the reference lists of key articles. These articles were read, cataloged, and thematically analyzed. The thematic analysis identified the five key attributes present in the model and their defining characteristics. Additional reading prompted by other doctoral projects, and the review process for this manuscript prompted an exploration of the nature of hermeneutic philosophy and its contribution to literary critique and defining reader–writer relationships. Genre theory, communities of practice, narrative inquiry, and storytelling were other areas of interest. This literature, in combination with some thought-provoking questions from two astute blind reviewers, have enriched my theoretical perspective and enhanced the revision process for this article. The Table provides a summary of the attributes of writing from this perspective, along with suggested nursing and interdisciplinary references. This model cannot be viewed as linear, nor can it be applied as a stepwise process. Writing using this model becomes, in the words of St. Pierre (2014), an “assemblage,” a symbiosis, and “the folding of one text into another” (p. 378). Although the nurse's writerly identity is at the core of this model, each of the constructs could be the focus of writing at any point in the process. The constructs presented act together and influence one another in an intertwined fashion. For example, the nurse writer cannot separate herself from her personal history, gender, culture, or past experience as a writer and as a discipline member. The nurse writer may also define her identity through her ability (or not) to be creative or show emotions, or by identifying (or not) as a writer. The Figure provides a visual representation of this model. Writing requires we “plumb the deep well of the unconscious” (Flower, 1994, p. 41). Whether deliberately presented or concealed, the writer is present in the work at all junctions in the form of writing voice (Mitchell, 2017). Knowledge cannot be created without a knower, and all knowledge eventually is integrated into the writer's identity as self-knowledge (Nightingale, 1988). Ivanič (1998) identified that we construct ourselves as individuals by positioning ourselves with respect to our standpoint and argument. Flower (1994) described how the act of constructing writing can create a site of conflict when the writer is caught between writing conventions or discourses they know how to handle and those they do not. Many other similar conflicts within the self occur in the writing process that function to bind identity to the other components of the model. Conflicts of self-belief, between emotional extremes, and negotiating self-regulatory capabilities in light of competing distractions are also relevant to forming an identity as a nurse writer. Finally, participating in reflexivity and reflective writing activities is essential to successful integration of identity within writing. Reflexivity also facilitates the integration of the writer's identity with the other components of the model. Relationality represents the interplay between the nurse writer and all the ways a newly created text refers to other texts in any way through citation, inspiration, or interpretation (Ivanič, 1998). In addition, the author must build a relationship with a remote audience. That relationship constructs a negotiated meaning of text between a reader and writer (Flower, 1994). A constructivist perspective recognizes that a writer generates meaning when writing, then through interpretive processes a reader generates another layer of meaning when reading (Straw, 1990). A nurse writer must be able to anticipate the needs of a reader and recognize and accept that those readers are creating their own interpretation of the work written. Also relevant to the relationality of writing is the ability to interpret the demands and expectations of teachers, instructors, and professors who assign writing, or journal editors (and peer reviewers) who are the gatekeepers to the sharing of knowledge in the profession. Relationship building in writing moves the nurse writer's work from an individual quest for knowledge to a broader conversation. Building relationships through writing can connect a writer to their community, alienate them, subject them to critique, or may go by unnoticed and be completely ignored (Olthouse, 2013). The perception of the emotions associated with writing can be positive or negative, and that perception will drive or inhibit the act of writing. Emotions are present in all stages of the writing process, from the anticipation of the project, to the act of writing, to receiving a response to one's writing from a target audience in the form of feedback or critique (McLeod, 1987; Richardson & St. Pierre, 2005). It is not normal to talk about writing as an emotionless task or, when it contributes to knowledge, to leave those emotions out of the text. To do so implies the writing would be disingenuous. Creativity has multiple meanings and interpretations but consistently requires originality and novelty to be present in the final product as defined by a particular social group (Kelly, 2016). Rolfe (1997) identified the aspects of academic writing that involve creativity as synthesis, interpretiveness, and knowledge generation. Although it may seem that creativity and the analytic requirements of academic writing are antagonists, seeing the inseparability of the two modes is a paradigm shift needed in academic writing (Antoniou & Moriarty, 2008; Richardson & St. Pierre, 2005). Academic writers, like designers, create for a specific purpose and a specific audience, and their creativity lies in the ability to give form to an idea (Kelly, 2016). Archibald's and Clark's (2018) discussion of how art can inform the research process is relevant. 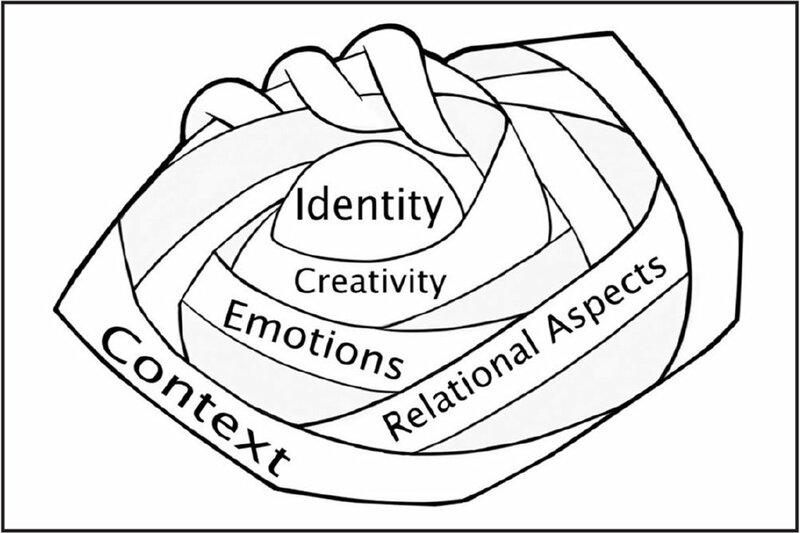 Creativity from an artist's perspective can tie the components of this model together through shaping identity, teaching emotional control, drawing from wide influences, and the necessity for prolonged engagement. Examining art and its processes warns us how hegemonic control can squash creativity. Creativity enables passion, and passionate writing is both sensual and emotional, or in Game's and Metcalfe's (1996) words, writing is “the place of dreaming” (p. 94). As Flower (1994) stated, “Writers' purposes are always bounded purposes hemmed in by innumerable constraints, unrecognized givens, and shared desires” (p. 45). The context of writing is the why of writing. Context is present in terms of discourse, disciplinary preferences, and cultural conditions (Game & Metcalfe, 1996; Hyland, 2004; Ivanič, 1998). The task at hand and the purpose of that writing task also provides context through the nature of the writing assignment, its perceived difficulty and demands of possible assessor(s), and the stakes involved in the writing process. The requirements of different genres of texts (e.g., academic papers, reflections, or care plans) and the nurse writer's understanding of how to manage that type of text will also influence the writing context (Hyland, 2003, 2004). In nursing, the writing context is constrained by the values of writing communicated by the discipline in the form of a theory–practice gap and an anti-academic discourse, as presented earlier in this article. Writing is not only a process of making meaning but also an activity through which individuals engage in self-understanding. After all, it is through introspection and self-reflection that meaning is constructed. The assumption that self-knowledge is inextricably connected to human competencies is now so taken for granted, that it is a central tenant of most modern theories and views of human cognition, motivation, and behavior. Although writing in nursing may not, in most programs, currently be taught from a socially constructed perspective, each attribute of the model presented is already a concern to nurses and writers. Inevitably, this means writing self-efficacy could be altered by intervening in any component of the presented model. The model has the potential to not only influence writing practices of nurses, nursing students, and nursing academics, but also writing pedagogies, with the recognition that scaffolding of all aspects of the model will be required from undergraduate to graduate to professional writing. The role of writing in education and in practice, as well as the pedagogical approaches that should be used to address the instruction of writing for each component of the model, require further explication through qualitative, quantitative, and mixed-methods research. Undergraduate writing needs to recognize the past experiences of the students entering programs, incorporate discipline-specific instruction, and avoid assuming teaching mechanical basics will act as a quick fix for students' writing problems. Writing instruction must be present in every course that includes a writing assignment. At the graduate level, the focus should be on voice and identity as a scholar and researcher and writing for knowledge translation. As nursing scholars Diekelmann and Ironside observed in 1998, “The practices of scholarship, reading, writing, thinking and dialogue are inseparable and belong together” (p. 1347). Although the model is not novel by its components, as these elements of writing are well described in other disciplines, it is novel within the community of nursing. Each facet of the model demands further exploration from a nursing perspective, including how the knowledge building present in the act of writing contributes to knowledge applied in clinical practice; thus, the model should not be considered an endpoint in this discussion, but rather a beginning. This article is intended to continue the conversation about re-visioning and enhancing the value of writing within the nursing profession. In order for writing to have meaning, it must be a process that allows individual writers to feel they are able to integrate their personal identity into the act of making knowledge. Positivistic, anti-identity, and deficit-based writing perspectives that emphasize surface elements of writing are constraints on nursing's ability to create research and knowledge that not only is relevant, but must feel relevant to practitioners and students. Nursing scholars who write about writing have asked, “For whom do [we] write?” (Ryan et al., 2014, p. 295). Currently, nurse academics write primarily for other academics. Viewing writing as a social activity may give nurses permission to write for broader audiences and thus diminish the power of the hegemonic elitism practitioners and students observe in academic writing processes. Nurses in practice and nurse academics share a common goal—improving the lives of patients—and our writing should reflect that. Allen, D.G., Bowers, B. & Diekelmann, N. (1989). Writing to learn: A reconceptualization of thinking and writing in the nursing curriculum. Journal of Nursing Education, 28, 6–11. Chaudoir, S., Lasiuk, G. & Trepanier, K. (2016). Writing assignments: A relatively emotional experience of learning to write in one baccalaureate nursing program. Quality Advancement in Nursing Education, 2, 1–21. Cottingham, C. (2005). Essay wha?Nursing New Zealand, 11(8), 25. Flower, L. (1994). 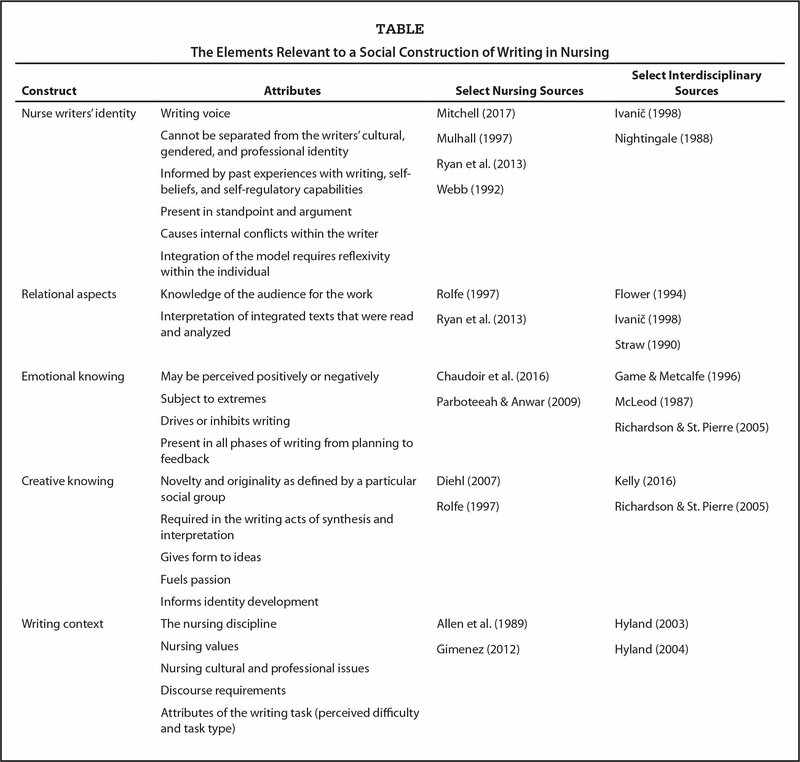 The construction of negotiated meaning: A social cognitive theory of writing. Carbondale: Southern Illinois University Press. Game, A. & Metcalfe, A. (1996). Passionate sociology. London, United Kingdom: Sage. Hayes, J.R. (1996). A new framework for understanding cognition and affect in writing. In Levy, C.M. & Ransdell, S. (Eds. ), The science of writing: Theories, methods, individual differences and applications (pp. 1–27). Mahwah, NJ: Lawrence Erbaum Associates. Kelly, R. (2016). Creative development: Transforming education through design thinking, innovation, and invention. Edmonton, Alberta, Canada: Brush Education. Nystrand, M. (2006). The social and historical context for writing research. In MacArthur, C.A., Graham, S. & Fitzgerald, J. (Eds. ), Handbook of writing research (pp. 11–27). New York, NY: Guilford Press. Pajares, F. & Valiante, G. (2006). Self-efficacy beliefs and motivation in writing development. In MacArthur, C.A., Graham, S. & Fitzgerald, J. (Eds. ), Handbook of writing research (pp. 158–170). New York, NY: Guilford Press. Paré, A. (2014). Rhetorical genre theory and academic literacy. Journal of Academic Language and Learning, 8(1), A83–A94. Richardson, L. & St. Pierre, E.A. (2005). Writing: A method of inquiry. In Denzin, N.K. & Lincoln, Y.S. (Eds. ), The Sage handbook of qualitative research (3rd ed., pp. 959–978). Thousand Oaks, CA: Sage. Straw, S.B. (1990). Challenging communication: Readers reading for actualization. In Bogdan, D. & Straw, S.B. (Eds. ), Beyond communication: Reading comprehension and criticism (pp. 67–89). Portsmouth, NH: Boynton/Cook. Torres, J.T. & Anguiano, C.J. (2016). Interpreting feedback: A discourse analysis of teacher feedback and student identity. Practitioner Research in Higher Education, 10(2), 2–11. Ms. Mitchell is Instructor, Nursing Department, School of Health Sciences and Community Services, Red River College, Winnipeg, Manitoba, Canada. The author thanks her doctoral advisor Dr. Diana E. McMillan, Associate Professor, College of Nursing, Rady Faculty of Health Sciences, University of Manitoba, for her valuable feedback on an earlier version of this article. The author also thanks her daughter, Emma McCormick, for her vision and creativity in drawing the figure included in this article. Address correspondence to Kim M. Mitchell, BA, MN, RN, Instructor, Nursing Department, School of Health Sciences and Community Services, Red River College, C608-2055 Notre Dame Ave., Winnipeg, MB, Canada R3H 0J9; e-mail: kmmitchell@rrc.mb.ca.